NASCAR Whelen Modified Tour championship contender Woody Pitkat will sport a different car number and colors this weekend at New Hampshire Motor Speedway, but the marks will be plenty familiar to longtime modified fans. Piktat’s regular No. 88 black and blue Chevrolet has transformed into a red and white No. 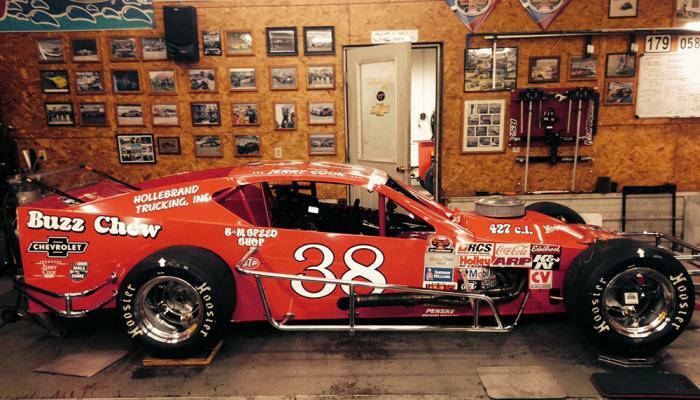 38 as a tribute to NASCAR Hall of Fame-elect Jerry Cook for Saturday’s F.W. Webb 100. The throwback scheme features a red paint with white lettering and numbers outlined in black, and the look comes complete with Cook’s primary sponsors Hollebrand Trucking and B&M Speed Shop. The No. 88 team’s present day sponsor Buzz Chew Chevrolet is also feature on the car with a retro logo. Although Cook had retired from competition by the time New Hampshire’s “Magic Mile” opened in 1990, the track is the most prominent venue the Whelen Modified Tour visits, providing a fitting place for the tribute to take place. The selection of the Buzz Chew Motorsports team for this tribute opportunity was also apt. Pitkat is the defending winner of the F.W. Webb 100 and is just one point out of first in the 2015 championship race. Cook barnstormed his way up and down the East Coast chasing wins and points. He compiled 342 checkered flags in 1,474 starts and earned six NASCAR modified division national championships from 1971-77. Only six drivers in the history of NASCAR racing at all levels have more series titles than the Rome, New York, native. “All of the racing they did, the accomplishments he had and the championships he won, it’s a huge honor for our team to be able to do this,” Pitkat said. Cook often raced a handful of times a week, and Pitkat – who maintains an aggressive racing schedule himself by today’s standards – feels a bit of a kindship to the man his team is paying tribute to. Cook will join former competitor and rival Evans, also from Rome, New York, as the only competitors from NASCAR’s weekly and regional touring division ranks to receive NASCAR Hall of Fame election. In a similar effort, Mystic Missile Racing featured an Evans tribute paint scheme at New Hampshire in the September 2011 Whelen Modified Tour event following his posthumous NASCAR Hall of Fame election. The NASCAR Hall of Fame Induction Ceremony is scheduled for Friday, Jan. 22, 2016, and will be broadcast on NBCSN and SiriusXM NASCAR Radio, live from Charlotte, North Carolina. Cook will be inducted alongside Bobby Isaac, Terry Labonte, O. Bruton Smith and Curtis Turner. ROME NY IS PROUD TO HAVE THE BEST MODIFED CHAMPION IN THE HALL OF FAME.JERRY COOK AND RICHIE EVANS. LETS SAY RICHIE EVANS AND JERRY COOK,JUST BECAUSE.LOL.